Serial co-founder Andy Baio re-introduced Upcoming, the collaborative events site. Purchased by Yahoo in 2005 and shutdown last year, Baio is relaunching the site via Kickstarter. The site was a collaborative calendar of art and tech events. Curated by the community, Upcoming surfaced what was happening in your area and what your friends were doing. 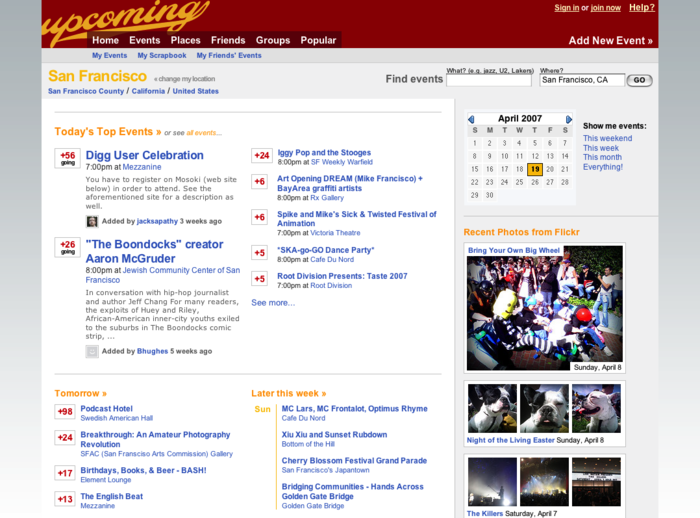 The original site launched in 2003. After the Yahoo purchase in 2005, Baio became disappointed in Yahoo’s lack of commitment to maintaining the community site. He left Yahoo in 2007. A month ago Baio was contacted by Yahoo. The company offered to sell him back the Upcoming.com domain. He jumped at the opporunity to relaunch he community event site and today he posted his relaunch plans to Kickstarter for funding. The $30,000 goal should be relatively easy to achieve. Within eight minutes of the announcement, the Kickstarter generated $2,600. Baio is co-founder of the arts and technology XOXO Festival, former CTO of crowd-sourcing site Kickstarter, former Technical Director at Yahoo, and all around nice guy. Update: The Kickstarter page has reached its $30,000 goal.